So here’s my much awaited and much anticipated review of Vince Stanziones Spread Betting Course or System (call it what you will) entitled “Making Money From Financial Spread Trading By Vince Stanzione”. Making Money From Financial Spread Trading – What’s in the Box? You get a welcome letter thanking you for buying the product, listing it’s contents and pointing you in the direction of a few other bits an pieces on the web. You also get a user name and password to access Vinces website. A Sharescope Cd-rom. Apparently this contains a Full copy of Sharescope with 5 years of historical data, so if you wish to back test things you can. I wouldn’t know if this is true or not becasue I haven’t even put the CD in my Laptop. Why would I proRealTime does everything I need and it’s certainly capable of screening for stocks using the strategies Vince suggests. If however you do wish to use Sharescope you will need to choose one of their subscription packages to get up to date data. The ‘Making Money from Financial Spread Trading’ Work book. Basically a folder with a load of A4 printed sheets inside. The place I started is the ‘Making Money from Financial Spread Trading’ Work book. Obviously with Spread Betting being a regulated activity the book has the relevant disclaimers and risk warnings. I would say the risk warning could be made a little clearer but anyone who’s been spread betting for more than a few days will be very familiar with the risks involved. There are around 140 pages of what I would regard educational material plus over 70 pages of slides from the DVDs. My first thought on these slides was ‘what’s the point?’ They are useful however, as you can refresh your memory of the DVD content without having to play the DVDs again and skip to the relevant sections. There’s a 12 month trading Log included near the end. This is a good idea although, if you have excel use an excel spread sheet instead. It’s much easier to keep track of and make any changes. That said this is only my opinion, if you prefer using a pen and paper then you have a trading log to use. One suggestion would be to photocopy it first, just in case you make it past 12 months you may want to continue using the same log. If you make a few photo copies then you have a trading log for a few years. The main body of content really is educational material. It goes through the lot including, the basics of making trades, the order types involved, different instruments you can trade and Vinces own spread betting strategies. I’m sure most people will probably skip straight to the strategies. I know when I received the package (which came the next day after ordering by the way) I was very tempted to skip straight to the strategies and start trading them. I resisted this temptation and didn’t regret it. I would strongly urge you to do the same. There’s a lot of additional information that shouldn’t be overlooked. The most important thing you can take from all this information, especially if your new to spread betting, is Vinces experience. Spread betting experience is one of the most important things and although you cannot learn experience, you can learn from the experience of others. One of the main reasons that I started spread betting beginner .com is to share my experience, limited as it may be, with others. I also added the forum so others can share their experience with me. So use the material Vince provides in the work book. Treat it as a home study course, make notes, write questions, I’m sure you will not regret it. If you do have any questions I’m sure Vince will try his best to help you. If not then join the spread betting forum and ask them there. I’ll do my best to help you out and I’m sure the other members will too. The course material covers almost all types of instruments that are available to be traded such as Currencies, Commodities, Individual Shares, Sector Indices, Exchange Traded funds (ETFs), Interest Rates, Property Futures, Mortgage Spread Trading, Options, Fixed Odds & Digital Options. Onto the reason most people probably buy the package, the spread betting strategies. For obvious reasons I cannot detail the strategies that Vince includes in his course material. If I did I’d get in trouble and we don’t want that. The strategies that he offers are pretty straight forward an easy to follow. How I mentioned earlier you can write stock screeners for almost all of them and then you are just presented with a list of potential trades. That’s what I do anyway. I don’t want to spend hours looking through charts for setups when a I can make a machine do the same thing in seconds. If you are struggling with writing the stock screeners in proRealTime you can e-mail me an I will do my best to help you out. You will need to prove you have a copy of Vinces course material though by giving me the details of the strategy you require. Obviously I can’t add the screeners to the site as I would essentially just be telling you what the strategies are via the code, come on I’m not that silly (even if I do look it). The thing I really like about a couple of Vinces strategies is they get you on the right side of a trend should one develop. It may take a few bites of the cherry before you catch the big trend but law of averages suggests if enough time passes a trend should eventually form. When it does if you’ve followed the system you should be on the right side of the trend. The systems all give you entry and exit criteria however they don’t all give you stop locations. The strategies that I’m referring too don’t actually require stop locations as the exit criteria takes care of the trade exit. My personal view is to always trade with a stop loss in place just in case the unexpected happens. Don’t worry if you e-mail Vince he will suggest some stop levels and I’m going to e-mail him making the suggestion that he adds these to his course material, if he adds them or not is another story. Vince emphasises the KISS (Keep it simple stupid) trading philosophy. I agree with this approach, there really is no need to make trading more complicated than it absolutely has to be. Why would you? I mean you wouldn’t make driving to work more complicated than it needs to be would you. Why would you want to spend longer in traffic than you needed to? You wouldn’t. You want it to be as simple and easy as possible. The DVDs are good to watch and there’s some other useful information in them that is not covered in the work book. I would strongly suggest as you watch the DVDs you have a pen, notepad, the sildes from the workbook and the remote control with you as you will want to pause the DVD and make notes, I know I did. 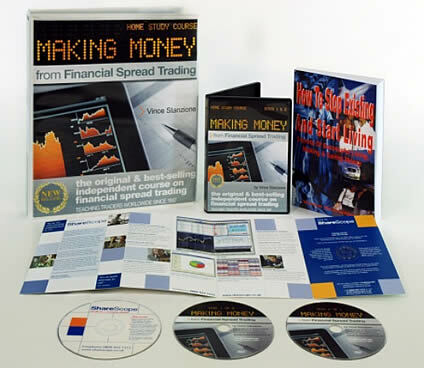 There are some more spread betting strategies contained within the DVDs and you will definitely want to make a note of these to study them further. I can’t really comment/review The Book “How to stop existing and start living” as I haven’t read it all yet. I’ve started reading it but with one thing and another I haven’t finished it yet. My review of this will have to wait for another day. Again I haven’t read this yet as I just haven’y had the time. When I have read through it I will notify you via a post on my spread betting blog. In summary I would say this spread betting course is really what you make of it. If you buy it, read it once, leave it on the shelf and then complain “I brought this spread betting system and it was a complete waste of money” then you only have yourself to blame. If, on the other hand, you use the course material as intended and study it over and over again I’m sure you will not be disappointed. I would suggest you set some time aside to work through the material. One weekend set a whole day aside to work through the work book and DVD’s making notes as you go along. Then spend the week reviewing your notes and digesting the material further. Then a few weeks down the line do the same again. Then once your confident you understand the material start to put the theory into practice but remember, take it slow there’s no rush and there’s no such thing as a missed opportunity in the spread betting world. If you miss an opportunity today an even bigger opportunity could come along tomorrow. If you wish to purchase Making Money From Financial Spread Trading By Vince Stanzione please visit Vince Stanzione’s website.